A system of official terrorist 'Threat Levels' was introduced in the UK on 1 August 2006. The initial threat level was 'Severe', and briefly 'Critical', before returning to 'Severe' on 14 August 2006. Home Office have denied (in other correspondence to me) any link between voluntary data retention, and Counter Terrorism, "The two issues are not and never have been linked". In recently received correspondence, they emphatically deny a contractual relationship of any kind has existed between them and Phorm. A significant conflict of interest arises if the State contrives contrive to mix economic intelligence gathering for commercial exploitation, and conventional intelligence gathering for civil security. The Home Office advice document was prepared without wider industry consultation, or independent legal advice. In particular, the rights of web site owners and e-commerce businesses to expect private unencrypted communication with visitors and customers were not adequately considered by the advice document. The document ignores the valuable marketing/economic intelligence that would be gleaned by observing a customer's interaction with a web site or e-commerce business (effectively industrial espionage). Phorm were asked to approve the wording of the advice document prior to release; "If we agree and this becomes our position...", "I should be grateful if you would review the attached document, and tell me what you think"
Despite Government denials by Tom McNulty MP, and Lord West of Spithead the advice document was intended for publication; "Please feel free to make the attached document available to your clients, who may in turn share it with their clients and prospective clients", "Feel free to share this document as you wish"
There is an item of correspondence on 7 December 2007 referenced in the first correspondence file that was not included in the FoI release; "Your message of 7 December doesn't quite say that"
The Home Office have finally completed their internal review of my Phorm FoI requests, after 9 months (ICO state that internal review should take an absolute maximum of 40 days!). Despite Simons Watkins misleading email, which he would have known was completely false at the time he wrote it, they consider that his response was outside the Freedom of Information Act legislation. Needless to say, I disagree, the FoI act should apply to any request for information. Knowingly sending misleading information stinks. 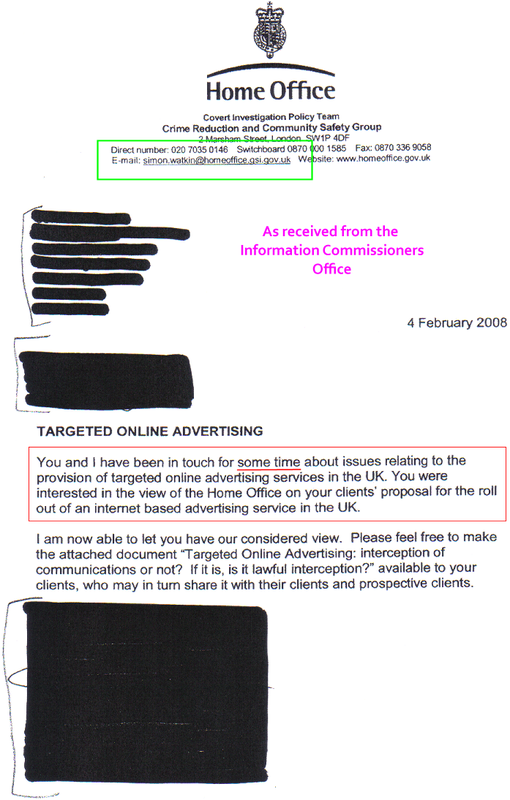 They don't account for the missing items of correspondence, such as the 7 December 2007 email referenced in the first correspondence file and the additional information in the second disclosure concerning contact with 121Media in 2006 and early 2007, all of which was excluded without explanation at the time of the response to the FoI. One surprising comment, I'm told in the document that disclosing information would mean a disclosure to a 'genuinely interested and concerned applicant automatically opens it up for disclosure to anyone, including those who might represent a threat to the UK'. Bearing in mind Phorm is supposedly an advertising system, its hard to see how disclosing information about the relationship between the Home Office and Phorm might pose a threat to the UK. My Home Office FoI requests remain subject to internal review since July 2008. A complaint has been with the Information Commissioners Office since early November 2008. It has apparently passed through three separate ICO teams without resolution. I have no word on the reason for the delay, either in the Home Office or the ICO, and no date when that investigation will be complete. I asked the Home Office to disclose Home Office staff attendance at 'Le Cercle' meetings, details of correspondence and meetings with Lord Lamont, and any lobbying conducted by him. In an email response the Home Office denied any knowledge of 'Le Cercle', or any exchange of correspondence between the Home Office and Mr. Lamont. My Home Office FoI requests have been subject to internal review since July 2008. The Home Office have again missed a promised 'deadline' for providing requested information, and completing an internal review. A complaint to the Information Commissioners Office has commenced. My Home Office FoI requests have been subject to internal review since July 2008. I've recently received a letter from the Home Office indicating that review will now not be completed until October. That's approaching six months since the first FoI request was made. "What are the responsibilities of the Office for Security and Counter-Terrorism concerning Part 1 of the Regulation of Investigatory Powers Act 2000. [HL4904]"
"When they first became aware of BT's trials of behavioural targeting systems... [HL4801][HL4802][HL4803][HL4804][HL4805][HL4806]" - Note this answer makes no mention of the correspondence first received by the Home Office in November 2006. The second formal disclosure includes details of Home Office correspondence from unnamed sources (presumeably BT/Phorm) concerning Phorm as early as November 2006. At that time Phorm were trading under the name '121Media'. This document is also referenced in an article by The Register. This is still not the final response - the Home Office are currently conducting a formal Internal Review. Apologies for the delay publishing this material, I was hoping to complete the picture before uploading, but it seems unlikely to be complete until August or even September due to Home Office Internal Review. There was a single file of documents, and a covering letter. Given the number of pages, it wasn't possible to upload the files at full resolution. If there are any pages which require a high res scan, rescanning, or you have a special requirement for a full high res copy of the file on CD, send me a message via this form and I'll try to help. The initial response from Simon Watkin is reproduced below. Names of third parties have been obliterated. I have left the names of Home Office officials because they are significant to the subsequent revelations. The initial response makes no mention of the extensive contact between the Home Office and Phorm stretching back to November 2006. Instead, a more recent, more cursory relationship is implied.